I was watching my new favorite Reality TV Show last night - The Shark Tank. Entrepreneurs with dreams go before five filthy rich people like NBA Dallas Mavericks owner Mark Cuban and QVC celebrity inventor Lori Greiner to make a pitch for money to help them launch a new product or service. The Sharks then tear into the entrepreneur asking pointed questions to see if the idea really can make them money. If the idea is good the sharks make offers. If the idea is bad, the entrepreneur walks away empty handed. I watched two episodes last night and then couldn't get the show out of my mind. I dreamt all night that I was standing before them asking for money and they were grilling me with tough questions about the viability of my store, the reasons why I thought we were successful, what we were currently doing to achieve our goals, and what I thought we needed to improve. The big question, of course, was what would I do with the money I was asking for, and how much of the company would I give up to get that money? Man, was my subconscious telling me something last night or what? Fortunately, my over-sized ego and tireless efforts to understand my business better were more than up to the dream-based challenge. I stared down the sharks, answered all their questions, and had them fighting over who was going to help me. The best thing was I woke up refreshed with some new clarity to what I really needed to do to accomplish my goals. You might not be so lucky as to have such an active, imaginative subconscious. That's okay. Here is an exercise that you can do in broad daylight. Then, pretend you are going on the show to ask for money. How much of a stake in your company would you give up for that money? What makes you confident you would get a good return on that investment for your new partner? How will you answer the criticism for your past record? Those questions might not be easy to answer. But if you want to swim with the sharks, you have to be prepared. 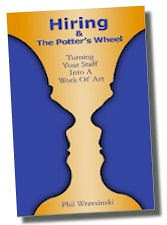 PS The best part of the dream was when I handed them each a copy of my book, Hiring and the Potter's Wheel: Turning Your Staff Into a Work of Art and Mark Cuban nodded his head in approval. If you want to see even more, look up "Dragon's Den" - Shark Tank is the American re-branded version of the international "Dragon's Den" franchise. It has been running on CBC (Canadian Broadcasting Corporation) for 7 seasons. Some of the same people(Robert Herjavec and Kevin O'Leary), same format! Thanks, Nicole! I will check it out. I like both Shark Tank and Dragon's Den. The Dragon's (British version) are a little meaner, which makes for better TV but I have a better sense of the Sharks personalities and success. Back to your blog post, great suggestions. The other day at a dinner I was caught off guard when someone asked me a question regarding the size of the market. I should have those numbers handy because you never know who will ask. It makes sense to be prepared because you never know when you will encounter a shark - even a friendly one. My high school homeroom teacher and swim coach always said, "Luck is when preparation meets opportunity." Like you said, you never know when you'll encounter an opportunity.